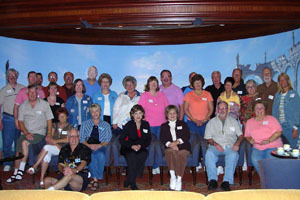 A Cruise Critic Meet & Mingle is a gathering of members who have chatted with one another within our community prior to their cruise. 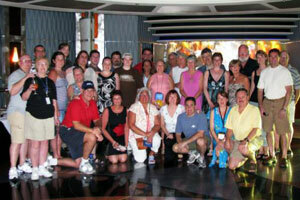 Meet & Mingles are hosted by a variety of cruise lines, usually on all sailings that are 7 nights or longer in duration. See below for the list of participating cruise lines! For most Meet & Mingle parties you'll be able to register to attend approximately one year from your sailing date; some party dates are open through a cruise line's published itinerary schedule. A lounge or other venue is provided, as are a variety of refreshments depending upon the cruise line. Why should I go? This is an easy one, of course! You've interacted with each other for weeks, months...some of you for years! Cruise lines appreciate and recognize your loyalty and want to make your cruise vacation special. Don't pass on an opportunity to meet each other. You'll be glad you did! Join the discussions on the Meet & Mingle Roll Call forums before your cruise to get to know who you'll be sailing with. Find the ROLL CALL for your sailing! Don't Sit -- Mingle! I cannot stress this enough; when you enter the Meet & Mingle, don't just park yourself in a seat. You won't have a good time. Just remember that everyone else in the room is there to meet you...and vice versa! Get up...move around...MINGLE and you shall meet and make great friends. When You Return From Your Cruise, Don't Forget to Share Before the memories fade be sure and share your Meet & Mingle experience with everyone in the community. Continue to keep in touch with your new friends in the Roll Call forums. If you've taken a picture, email it to us, and we'll help you get it posted on the boards. Everyone loves to see pictures of community members, and you'll be able to share firsthand just how much fun a Meet & Mingle can be!